Can Sea Buckthorn Oil heal Rosacea? ​​​​RosaSkin Normal to Dry facial cleanser is extremely gentle and perfect for rosacea sensitive skin that needs an extra touch of moisturizer. Infused with Organic Honey and pure cold- pressed Buckthorn Oil, this natural amber, cream-colored cleanser calms the redness on the face and leaves it feeling soft, smooth, and clean. With a pH between 5-6, RosaSkin cleansers do not interfere with topical ointments and are safe for laser sensitive skin. ​​For our Normal to Oily facial cleanser, we've removed the oil content and added Organic Lavender to leave oily skin with a clean, well-balanced feeling. Moisture balance is important for everyone, but with rosacea sensitive skin, balance is key. Organic Aloe, Lavender, and Pro-Vitamin B help us achieve that goal. As is our dry skin cleanser, Normal to Oily is perfectly pH balanced between 5-6. ​​This perfectly balanced moisturizer is formulated with the highest Grade of organic pressed Aloe Vera leaf extract, a delicate layer of JoJoba, pure cold-pressed Buckthorn extract and a host of other gentle, rich ingredients. 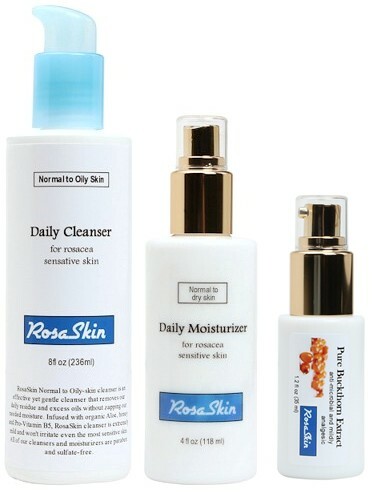 RosaSkin Normal to Dry moisturizer is perfect for rosacea sensitive skin that needs an extra touch of moisturizer. ​For Normal to Oily skin, we’ve adjusted the oil content and added extra Aloe Leaf Extract, a natural absorbent that will help balance the oils in your facial dermis and reduce inflammation. In all our products, we avoid Salicylic acid, hydroxy acids and alcohol as they are also known irritants to the delicate rosacea sensitive skin. Our moisturizes are formulated to calm your rosacea, reduce redness and help even skin tone. All Moisturizers contain SPF 20. ​​​​ Our best value package! Over $160.00 in products for $119.95! ​​​​​RosaSkin CoQ10 Rejuvenating Facial Serum is packed with all the essential nutrients needed to restore and improve your skin's health as well as fight back against the march of time. Used daily, CoQ10 Rejuvenating Facial Serum will heal sun damage and even skin tone while smoothing and firming the surface of your skin. 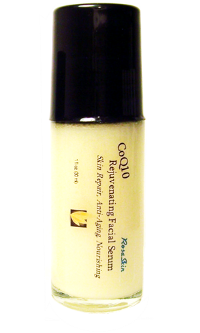 RosaSkin's CoQ10 Serum is not just for your face, either. It has shown wonderful results on neck skin as well. ​Oh, and you'll love the organic aroma of fresh roses left behind after using it. At RosaSkin we recognized the SBO's healing and rejuvenating powers for rosacea and searched for the most organic extract. We found it in purest form, cold-pressed directly from the seed and are delivering it to you without additives of any kind. ​ This wonderful Healing Trio includes our 8oz Daily Cleanser, 4oz Daily Moisturizer and the 2oz size of our Pure Cold Filtered Buckthorn Oil. Purchased separately, this combination would cost $99.85. This package saves you nearly $30. 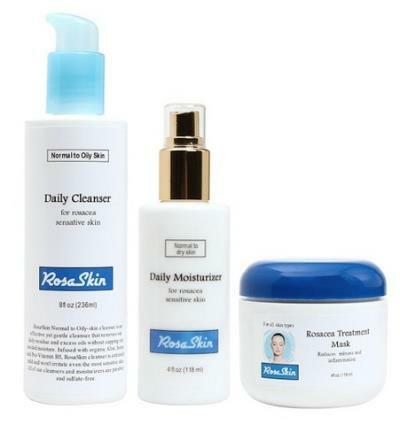 The RosaSkin Trio consists of our Calming Facial Cleanser our Calming Daily Moisturizer and our CoQ10 Rejuvenation Facial Serum. This is a perfect trio of facial care products for rosacea sensitive skin and buying them together saves you over $27.00! Our Natural, certified organic facial care products are formulated specifically for rosacea sensitive skin. Most of our products are Gluten Free and all of our products are free of dyes, perfumes, lanolin, salicylic acid, benzyl peroxide, alpha-hydroxys, glycolic acid and parabens ... ingredients known to irritate delicate skin. Don't forget to protect your skin with sunscreen!